Ask fellow campers about "Oceanside Beachfront RV Resort" and nearby attractions. Pulled in late at night, yet the staff was super friendly. Spacious site, ocean breeze, and the sounds of waves were awesome. Hook-ups were really easy and in the perfect spot. The walk to the beach was under 50 yards and was a great place to spend the day. We stayed for a short weekend, but really enjoyed it. We camped at Oceanside Beachfront RV Resort in a Motorhome. Great location right next to the ocean,however the office staff is one of the worst we have encountered. We booked a week for a 45 ft. coach but they had us in a 40ft. site. After several minutes they gave us a spot for a week and charged us for a week. When I went went back to the office to stay longer,I found out I had to leave after six days. I could go on but just to say this is the worst I have seen. The space they had me in ws way to small for my coach. We camped at Oceanside Beachfront RV Resort in a Motorhome. We really enjoyed our stay at this park. Our site while a little close to the folks on the utility side of our motorhome, but there was nice large grassy/sand area outside of our door, a nice picnic table, and fire ring. The site was long enough so that we also had a fairly large area behind our motorhome looking up into trees and interesting rock formations. The campsite was clean and the roads fairly well maintained and easy to get around on. The site was well sheltered from the wind. The ocean location itself was fantastic! A long, sandy beach, tide pools, a secluded grotto, and rocks to climb on. We camped at Oceanside Beachfront RV Resort in a Motorhome. This RV park is actually beachfront and oceanside. 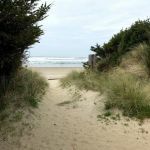 It's located just south of Charleston, OR, about 10 minutes from Coos Bay. The driveways and site pads are gravel/dirt. The sites have grass strips between them. We had a back-in, full hook-up site with 50 amp electric, but the connections are oddly located. The electric pedestal and sewer connection are about midway in the site and the water hookup is almost at the absolute front. Better have an extra water hose. The restrooms were excellent, clean and in good condition. The free WiFi was also excellent. Every RV park should have WiFi of this quality. It's a short walk from the back of the park to directly on the beach. We paid $34.82 per day with Good Sam discount. We camped at Oceanside Beachfront RV Resort in a Motorhome. Check out Chuck's Seafood market in Charleston. If you like raw oysters, they have a great price on locally grown shucked oysters. They also smoke and can their own oysters, salmon, etc. We love this park. There is a private walkway to the beach that is about a 100 yards from where we parked. Our site was level and had plenty of room for our 40' motorhome and our 4 dr Jeep. The staff was very helpful and very nice! 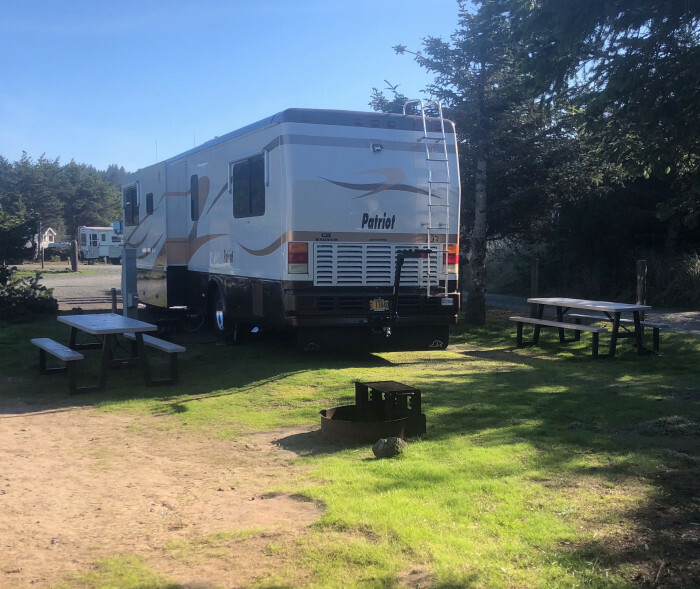 Probably the best park we saw in the Coos Bay Area. We camped at Oceanside Beachfront RV Resort in a Motorhome. You have to go to the Fishermans Grotto resturant in Charleston. Best clam chowder we have ever eaten!! Loved this park. Location is excellent. Sites are a little closer than we like but who cares the location makes up for it. Don't know about satellite or tv reception. When we are on vacation, we disconnect from the tv. The staff was very friendly and helpful. We would definitely camp here again. We camped at Oceanside Beachfront RV Resort in a Motorhome. The park is medium sized, wide gravel roads, with both back-in and pull-through sites. We were nestled into an end site with another site only on one side, and were protected from the contant beach wind but could still hear the soothing waves. The site was gravel and fairly level, and the hookups were good. We did not try the cable. The site had both picnic table and a nice fire-pit/grill, which we used. The parks' WiFi was very good, only dropping a coiuple of time throughout our 4-day stay. Verizon was about 2 bars. The bathroom/showers were handy and clean, and the laundry room, though small, was adequate and clean. The park had maintenance people running around constantly, so the place was in good shape. One neighbor came in and backed on to a water pipe, creating a nice, high fountain. The maintenance people had it fixed within 30 minutes, and we never lost our water pressure. Very competent crew! 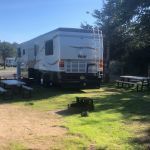 We were quite happy with everything about this RV park and can highly recommend it! We would definitely stay here again. We camped at Oceanside Beachfront RV Resort in a Motorhome. The beach is ~right~ ~there~, so that's pretty cool. Also, at low tide, you can walk out on Yoakum Point (to the left of the beach as you are facing the ocean) to look at tidepools. 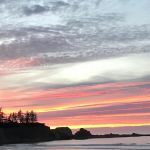 Down the road is Cape Arago State Park, Sunset Beach, etc., all of which are outstanding places to picnic, hike, inspect tidepools and see sea lions. Millers, just up the road in Charleston, is really very good! These sites are right along the beautiful beach area, just go over a small berm and you are on the sand. There are a mix of back in & pull through sites, all which seem to be fairly roomy. The sites have grass/dirt & you can put mats down. Picnic tables & fire rings are on each site. Negative: not enough machines for laundry & dog area should be fenced as you have to go between 2 camp sites to get there. Pros: There is a "crab shack" on site which is open Thursday thru Sundays, really good fish & chips & convenient, otherwise you have to drive to get to any restaurants, etc. This place fills up, make reservations way in advance, seemed like the nicest place around with full services. Wifi & cable worked fine. Very nice management & very dog friendly including the beach. We camped at Oceanside Beachfront RV Resort in a Motorhome. This campground was fantastic. It is steps from a very long and excellent beach. If you walk toward the harbor, about a mile, you can see the lighthouse. It is not a public lighthouse but it is a great view. If you walk at low tide you can go around a little bend and there is a private little beach with tide pools and a small cave. The staff were BEYOND friendly and so nice. You even get a little bag with chocolate chip cookies when you check in. They also have safari tents that we peeked in and were so cute. They have little cottages to rent also. If you are a tent camper you have sites directly on the beach. We could not physically see the ocean from the full hook up site but seriously steps from the beach. Map wise, don't get confused as the address is in Coos Bay but you are actually in Charleston. Approx two miles from the campground are three state/federal parks that are also beautiful. We camped at Oceanside Beachfront RV Resort in a Motorhome. Eat at the Coach House in Coos Bay (sit outside in the covered patio) there are heaters and the food was excellent. Its all about location and this park is right on Bastendorf Beach. Park of a small chain of RV parks across the country. (We've stayed at one of their Moab locations). Paved main roads then gravel approach and grass/gravel spacious sites. Some, like ours, had plenty of room to park your toad and even set up a tent if needed. Be prepared for serious moisture as the coastal mist rolls in almost every evening making everything appear as if there was a downpour overnight. The heat of the day takes the wetness away quickly. No issues with power or water; they have a community dump on the way out (as most beachfront parks do, if at all) which we did not use. Ice, refreshments (including local wine), ice cream and just a few basics available in their store. The more remote tent sites seemed to be a gathering place for dog walkers who didn't care to pick up after themselves; told the proprietors and they reacted quickly. Will definitely stay here again due to the beach access. We camped at Oceanside Beachfront RV Resort in a Motorhome. The small community of Charleston is a very short drive away and has a few tasty restaurants. Small, secluded beach immediately to the south of Bastendorf is accessible at low tide if you don't want to get wet or anytime if you don't mind. Thank you for your detailed feedback. We look forward to hosting you again and providing you with another memorable stay. It is the closest park in the area to the beach - site 44 was maybe 200 feet from the beach. Because of a crab festival in town and being Presidents Day weekend, the park was quite full, but very quiet. Most sites were very adequate for large rigs. We stayed here for 3 nights. The park is very clean. We camped at Oceanside Beachfront RV Resort in a Motorhome. We liked this place. Clean park. Lots of different sized/shaped sites. Most were pretty level- a mixture of gravel & sand. Power & wifi were fine. OK to have fires in the nice fire rings at each site. A very short walk to the beach. Great oyster farm in town too. A bit off the 101 but well worth the quite. We would love to stay here again in our 40' Allegro bus. We camped at Oceanside Beachfront RV Resort in a Motorhome. Park is on the ocean, with beach access. No noise except the waves. Roads and sites are gravel. Not real big, close to neighbors. Power, water good. Cell weak (AT&T) but usable. We would stay here again. We camped at Oceanside Beachfront RV Resort in a Motorhome. We enjoyed our stay here. Downside - grass and gravel sites, generally level, but being near the ocean and damp conditions, tend to track a little stuff in the coach. A little ways from grocery shopping. Good more than overcomes this. Really close to a sheltered beach, yet tucked in enough to protect against the strong winds you sometimes get on the coast. Friendly staff (but somewhat in disarray as new ownership and some are new) will get better. WIFI was generally good. Nice long pull through/back ins OK. Some long term, but not tacky. Cable was OK. Dogs loved the beach. We will definitely be back. We camped at Oceanside Beachfront RV Resort in a Motorhome. This RV park's best asset is the close proximity to the ocean. Only a short trail away is a secluded beach to enjoy. Tent sites are on the beach. RV sites are wide enough and plenty long. The area between RV's need some grass but there are tables on each site to use. They do have clamming and crabbing gear to borrow. We would stay here again because of the beach area. We camped at Oceanside Beachfront RV Resort in a Motorhome. The small town of Charleston is about 2 miles away and has a grocery and the usual seafood places and the port. Enjoy the beach! Grab a bite at the crab shack at resort entrance. Not far from town of Charleston, fresh seafood, cute shops, harbor for fishing/crabbing and a Marine Life Center. Check out Shore Acres State Park for great views and hiking and the new rum distillery on Seven Devils Rd. 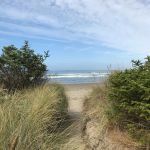 Charleston and Coos Bay have many interesting places to explore. Miller's at the Cove and Capn Jacks in Charleston had good food. The Thrifty Sisters is a cute shop in Charleston if you like thrift stores. Check out the state parks on 540. Beautiful! Chef Mark makes excellent Fish & Chips and Crab Cakes at the food truck. Reasonably priced as well! Be sure to go to Chuck's Seafood. They have the freshest seafood and their own canned tuna. It's the best. Scenic area with dramatic coastal landscaping, sunsets, whales, birds. All the activities you would expect in a beach community. The town of Charleston is quite charming typical harbor area, seafood, boats etc. Coos Bay is close, largets city in the area, and very handy. Plenty of restaurants in Charleston, great fish market (Chuck's Seafood). Are you affiliated with Oceanside Beachfront RV Resort ?